Zhou T, Zheng Y, Sun L, Badea SR, Jin Y, Liu Y, Rolfe AJ, Sun H, Wang X, Cheng Z, Huang Z, Zhao N, Sun X, Li J, Fan J, Lee C, Megraw TL, Wu W, Wang G, Ren Y. Microvascular endothelial cells engulf myelin debris and promote macrophage recruitment and fibrosis after neural injury. The clearance of damaged myelin sheaths is critical to ensure functional recovery from neural injury. Here we show a previously unidentified role for microvessels and their lining endothelial cells in engulfing myelin debris in spinal cord injury (SCI) and experimental autoimmune encephalomyelitis (EAE). We demonstrate that IgG opsonization of myelin debris is required for its effective engulfment by endothelial cells and that the autophagy-lysosome pathway is crucial for degradation of engulfed myelin debris. We further show that endothelial cells exert critical functions beyond myelin clearance to promote progression of demyelination disorders by regulating macrophage infiltration, pathologic angiogenesis and fibrosis in both SCI and EAE. Unexpectedly, myelin debris engulfment induces endothelial-to-mesenchymal transition, a process that confers upon endothelial cells the ability to stimulate the endothelial-derived production of fibrotic components. 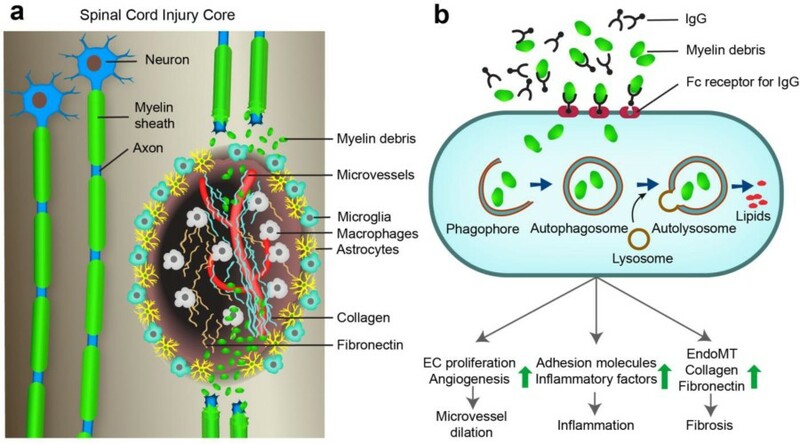 Overall, our study demonstrates that the processing of myelin debris through the autophagy-lysosome pathway promotes inflammation and angiogenesis and may contribute to fibrotic scar formation. To get repiar you need to clear up the debris. Typically we see macrphages and microglia as the cells that do this because this is what they are designeed to do. This study says that blood vessels clear up myelin debris as a consequence of neuroinflammation and this may help form the myelin scar. I am not sure where I stand on this. There are no references cited before the millenium in the paper, but in the 80s and 1990s people were desparately looking for the presence of MHC (as an antigen presenting cell ..but in most cases it was not there for MHC class II on blood vessel cels or astrocyes). To see if it was on the blood vessel we and others did this as electron microscopy, but I dont remember seeing loads of myelin in the blood vessel cells (like in the picture of the cells in culture in the paper) and if it was engulfing myelin you may think would see it. Also looking at expression profiling of brain endothelial cells (www.brainseq) there is very little expression of Fc receptor (Which would bind antibody) on mouse or human brain endothelium (Blod vessel cells) . Furthermore on the post on Friday on the genes expressed by oligodendrocytes there was the gene expression of blood vessel cells and no mention of Fc receptor genes was there, but there was MHC class I genes so as it was eating all that myelin maybe it would be a target for the CD8 cytotoxic cells with lots of haemorrages?..but that isn’t seem in MS, haemorrages are found in rhesus monkey EAE. MD2 thinks it’s a crock. It makes no sense and given all the histology done over the years I think someone might have spotted myelin debris in endothelial cells before.